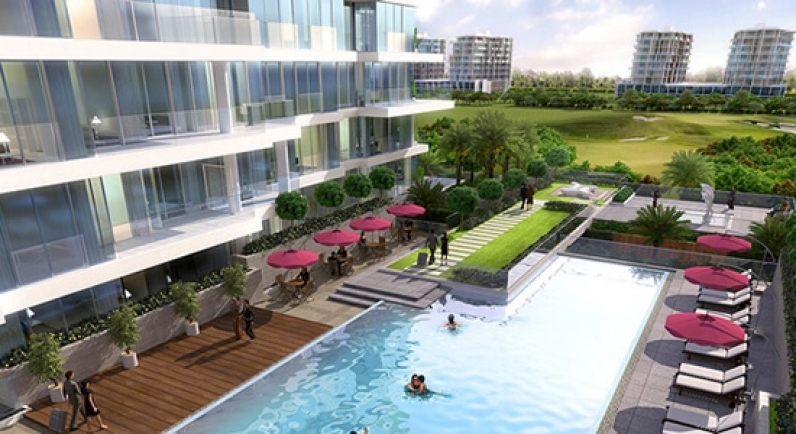 Damac Properties has included another two towers project at Akoya named Jasmine – Tower A and B. This unique set of towers offering convenient apartments in a variety of sizesthat are beautifully finished and every corner is planned to perfection. Akoya Jasmine is fully glass fronted buildings set within private parkland.Here we can choose different sizes homes between Studio rooms to 4 Bedroom. Every homeis planned to perfection along with townhouse arrangements.Jasmine-A building price starts from AED 708,000& Jasmine-B Tower is pricing at AED 1,100,000. The Jasmine @ Akoya is 70% complete and the rest is expected to finishin Q1 of 2018. Jasmine at Akoya is a twin-tower(A & B) project of 8 floors which is a part of 48 Millions Township. It is offering Studio apartment, 1 BR, 2 BR, 3 BR& 4 BR apartments.This newest & gorgeous apartment by Damac with large windows and terraces overlook breathtaking scenery. Every room is spacious, light and airy interiors as well as enough space to explore and relax.Jasmine at Akoya is not on/near thegolf-course like other developments in Akoya has but it is located along Akoya Park.The Jasmine Homes are available at affordable rates. * Jasmine "B" - 1 BR(AED 1,100,000)& 3 BR(AED 3,513,000) apartments. Damac Properties is a luxury real estate developer since its establishment in 2002.The latest offering from the ambitious Damac properties came in the middle of the year 2013 when they announced a super duper luxury project called “AKOYA BY DAMAC”. The company is famous for providing the best residences in Dubai. The company has expanded and has become one of the successful developers in the Middle East. Damac Properties also has a further 50 buildings at various stages of progress across the Middle East, North Africa region. With its excellent realty developments, Damac Properties now has expanded their work in Iraq, Jordan, Lebanon, Qatar and Saudi Arabia too. Akoya Jasmine is at strategic location allows easy access to the main network system that puts the city within a few minutes of your reach. It is just a short journey from the centre of the city and yet feels like a world away. Akoya by Damac is a prestigious and luxurious development offering a range of villas, mansions, town houses and golf condos, located in Dubailand. This gated community has world-class retail, leisure spaces and 400,000 square meters of lush green parkland, all scattered around the Trump International Golf Course. All properties are designed with a modern and contemporary finish and offers panoramic views over the golf course or the spectacular Dubai skyline. Akoya Jasmine is being designed at Dubai Hills in Dubai City, United Arab Emirates. The project is been proposed with a variety of lifestyles and signature amenities : - Basketball Court, Gym, Pound, Fire Place, Lake View, Pool, Back Yard, Front Yard, Fenced Yard, Sprinklers, Washer and Dryer, Deck, Balcony, Laundry, Concierge, Doorman, Private Space Storage, Recreation, Roof Deck, Internet.